A release date is finally confirmed. After months and months of speculation leading back to summer 2011, we will finally see the second collaboration between Dave White and Jordan Brand release. They are set to hit select Jordan Brand accounts such as SoleFly as a very limited release on February 11th. This is the second Air Jordan 1 Retro DW that Dave White and Jordan Brand have collaborated on for the "Wings for the Future" charity. This pair features a black-based upper with hits of red, white and cement grey. Similar in style to the first colorway auctioned off exclusively here at SoleCollector.com last year. 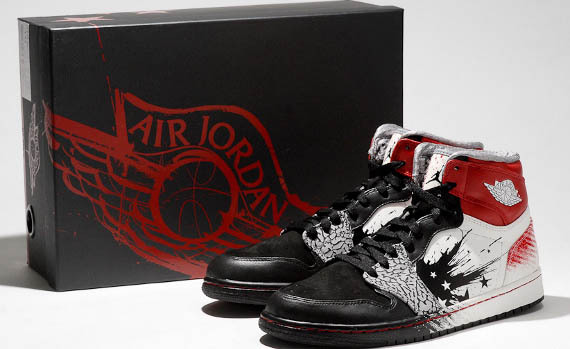 Retail is set at $175 and they will come in a special black Jordan box, also designed by Dave White. So now that the rumors of whether these will release or not can now be laid to rest, do you plan to try and grab a pair?